YoYo shims (also known as spacers) are small rings used to widen the gap of a YoYo. Usually, shims are used to widen your YoYo to make it less responsive for more advanced tricks. Shims are great for this, as it moves the YoYo string away from the response system of the YoYo (ie. the response pads). The shims are placed on both sides of the bearing, so that it sits up against the sides of the Yoyo. Browse our selection of shims below! 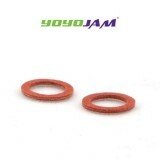 Use these genuine YoYoJam shims to increase the gap width of your YoYoJam YoYo. ..